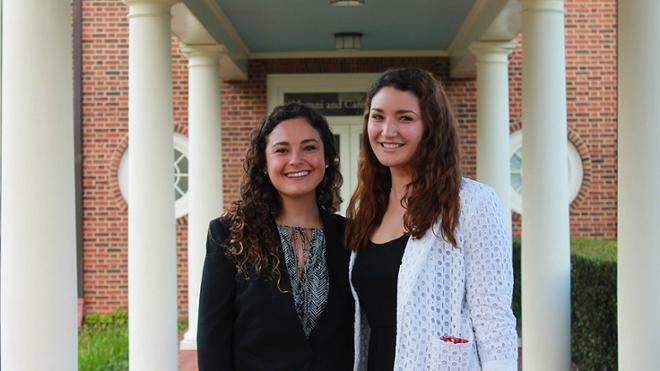 University of Richmond seniors Fabiana Ayala and Yasmine Karam have been awarded a $10,000 Projects for Peace grant for their proposal to support the economic empowerment of women in Bolivia. Their project, “TodoSuma: Addressing Women's Empowerment Through Crochet,” aims to create sustainable jobs for unemployed or economically-abused women in Cochabamba, Bolivia, by providing them with the skills necessary to earn income through the sale of crochet items. Through their business plan, Ayala and Karam hope to build a community of women that identify common challenges and create positive change. During the summer of 2017, Ayala and Karam will partner with community-based organizations to recruit and train women interested in earning an income from crocheting. TodoSuma's focus is connecting crochet artisans to international markets through different platforms and marketing initiatives. Their self-designed project was one of 120 selected among all undergraduates invited to apply from American colleges and universities that partner with the Davis United World College Scholars Program. Twelve UR students have won Projects for Peace awards in past years. Projects for Peace, the vision of philanthropist Kathryn W. Davis, is a competition that funds grassroots level projects developed and implemented by U.S. college students. These projects seek to promote peace and understanding in communities around the world.